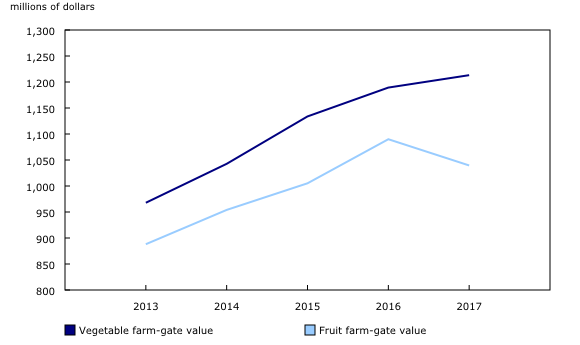 The farm-gate value of Canadian fruit and vegetable products decreased 1.2% from 2016 to $2.3 billion in 2017. This decrease was driven by the decline in the value of fruits due to unfavourable weather conditions and price decreases that affected some fruit varieties. Total cultivated area for fruit was 132 685 hectares, while vegetable cultivated areas totalled 103 669 hectares in 2017. Ontario, Quebec and British Columbia combined accounted for 89.9% of total vegetable cultivated area, while making up about two-thirds of total fruit cultivated area. The value of vegetables rose 2.0% to $1.2 billion in 2017. Carrots, tomatoes, dry onions, lettuce, sweet corn, cabbages and broccoli accounted for over half of the total value of field-grown vegetables in Canada. Carrot sales totalled $129.3 million in 2017, followed by tomatoes ($110.1 million), dry onions ($91.4 million), lettuce ($78.4 million), sweet corn ($75.9 million), cabbages ($72.5 million) and broccoli ($72 million). Broccoli had the largest price increase, rising 20.4% in 2017, with an average farm price of $1,697 per tonne. Yields for some vegetables were up in 2017. Dry onion total production yield increased 9.6% to 44.5 tonnes per hectare while the tomato yield rose 7.4% to 78.2 tonnes per hectare. The total value of fruits fell 4.6% to $1 billion in 2017, largely due to a drop in cranberry and blueberry value. Cranberry value fell 27.2% to $114.9 million, reflecting a production decline of 30.3% to 125 568 tonnes in 2017. This decrease in production was largely due to a drop in crop size in Quebec. Favourable weather conditions in 2016 drove Quebec production to a record 125 143 tonnes, before it fell to 74 284 tonnes in 2017. The bumper crop in 2016 was still negatively affecting low bush (wild) and high bush blueberry prices in 2017. The value of wild blueberries was down 48.0% to $47.4 million, while the value of high bush blueberries decreased 4.5% to $155.9 million. High bush marketed blueberry production was highly concentrated in British Columbia (94.6%), while wild blueberry production was mainly in Quebec and the Maritimes. Total apple production, which accounted for about one-fifth of the total fruit value in 2017, decreased by 15.4% to 345 568 tonnes. This decline was driven by a 31.8% drop in Ontario marketed production volume. Colder spring and early summer conditions in Ontario affected the 2017 season. The decrease in production was partially offset by an average Canadian price increase of 13.9%. Grapes accounted for 15.3% of total fruits value in Canada in 2017. Total grape value edged down 1.9% to $158.8 million. Ontario accounted for the largest share of the total grape value (53.8%), followed by British Columbia (39.8%). Strawberry farm-gate value increased 18.1% to $128.2 million due to an increase in production and price. This was the fifth consecutive year with an increase in strawberry production. The growing use of day neutral strawberry plants with June bearing plants and the use of tunnels are contributing to this increase. Sweet cherries (+46.1%) recorded the largest increase in value over 2016. Sweet cherries are produced mainly in British Columbia, where marketed production rose by 48.0% compared with a year earlier. The value of peaches increased by 21.2% in 2017. Peaches are largely produced in Ontario, where there was a 19.8% increase in marketed production compared with a year earlier. Every five years, following the Census of Agriculture, the estimates of the fruits and vegetables survey area, production and sales variables are reviewed and reconciled to ensure coherence with the Census of Agriculture. As a result of this review, revisions back to 2011 are now available and are reflected in the data in this release. Farm-gate value is the value received by producers at the point of first transaction, when ownership first changes hands. This value excludes any separately billed costs such as delivery, storage, marketing and administrative. To enquire about the concepts, methods or data quality of this release, contact Avani Babooram (613-769-5245; avani.babooram@canada.ca), Agriculture Division.